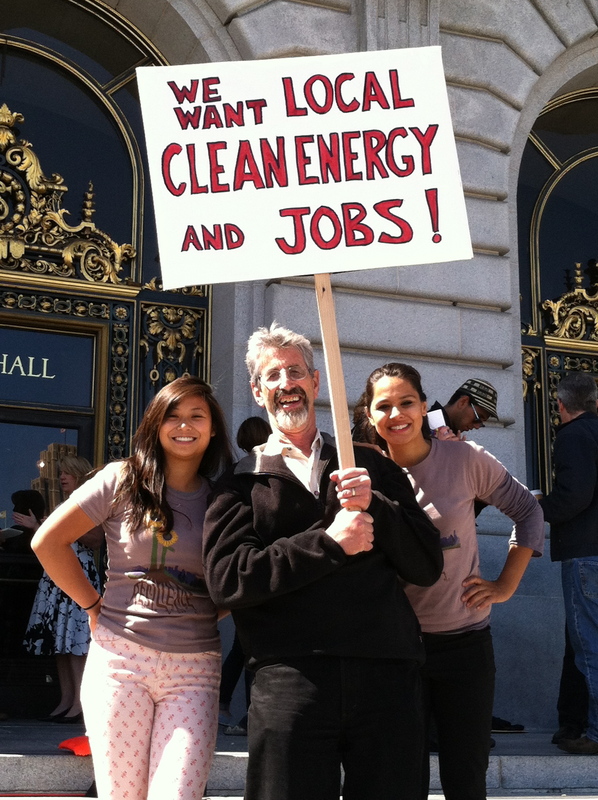 CleanPowerSF: About Face for Mayor Lee? In an apparent about face, San Francisco’s Mayor Edwin Lee, who has been blocking the launch of the city’s Community Choice energy program, announced on January 26th that he would support moving the CleanPowerSF program forward. “I call on the SFPUC (San Francisco Public Utilities Commission) to develop a program that is affordable for customers, greener for our planet, takes advantage of renewable technology being developed right here in our City and has a real plan for creating jobs for our residents,” said the Mayor. The Mayor’s turnaround seems to be the result of a recent study about community-based renewable energy in San Francisco, in particular CleanPowerSF. This study, pushed by advocates, conducted by the EnerNex consulting firm, and commissioned by San Francisco’s Local Agency Formation Commission (LAFCo), shows that the implementation of CleanPowerSF will not only reduce greenhouse gas emissions but will also provide thousands of jobs and generate billions in revenue for the city. In 2007, San Francisco passed a city ordinance to establish a Community Choice energy program in accordance with state legislation, AB 117, passed in 2002. Known as CleanPowerSF, this program was meant to sever San Francisco’s dependence on fossil fuels and to increase reliance on local and renewable sources of energy. The development of local energy resources would provide jobs for residents of the city while also terminating the monopoly that Pacific Gas and Electric (PG&E) holds over energy procurement in San Francisco. Thus, while meeting California’s Renewable Portfolio Standard, a Community Choice program would provide social, environmental, and economic benefits to the residents of the city and county of San Francisco. From its inception, however, CleanPowerSF has met with opposition from PG&E and its political allies. For several years, the SFPUC, the governing body charged with implementing CleanPowerSF, remained idle on establishing the program. After an initial bid for energy procurement failed, the SFPUC entered negotiations with Shell Energy North America in 2010, resulting in a proposed five-year contract. Rather than creating local assets, San Francisco would grant energy procurement privileges to a corporation known for its human rights violations and flagrant environmental devastation. In response, community advocates successfully pressured the SFPUC to plan for a CleanPowerSF program that would build local renewable energy assets as mandated by the 2007 ordinance. As these plans developed and San Francisco neared the launch of the program, PG&E flexed its muscle and put on the brakes. It worked through its proxy, San Francisco Mayor Ed Lee. Until recently, Mayor Lee opposed CleanPowerSF, claiming that such a program would be too expensive and that funds would be better spent on other public projects. Mayor Lee echoed the same arguments used by the utilities this past summer in supporting AB 2145, their attempt to kill Community Choice energy in California. Although AB 2145 was defeated by a broad coalition of environmental and social activists, utilities have shifted their strategy, fighting Community Choice at the local level behind closed doors. Mayor Lee’s opposition to CleanPowerSF has been a key factor in preventing the program from moving forward: he appoints the commissioners of the SFPUC, and by leveraging this power, he has blocked implementation of the program. Despite a 2014 launch date and $4.1 million spent on planning, the future of CleanPowerSF has remained uncertain. Pressured by CleanPowerSF advocates, LAFCo, which was established to hold the SFPUC accountable, commissioned the EnerNex study in 2014 at a cost $100,000. This study discredits the arguments proffered by Mayor Lee against CleanPowerSF. According to the study, a Community Choice program in San Francisco, if properly implemented, would create over 8,000 construction jobs and generate $2.4 billion in revenue over a ten year period, provide cleaner air for San Francisco communities, and move the City toward a zero-greenhouse gas emissions target. There also would be no need to contract with Shell. Despite a decade of resistance, this new study appears to have steered San Francisco toward a greener and more equitable future.